Take a little girl who loves music up to the point she composes in order to learn her school recitations. Decide she won’t have any piano lessons, although she is craving for them, leaving her no choice but to spy on others and ask for the help from her friends. Have those friends tell her about English pop music and American jazz music. Wait for some years, during which she will learn performing arts in France premier drama school, and where one of her teachers will encourage her to go and sing on stage. You get Yasmine Modestine, a pop-folk singer/songwriter, whose poetic songs are like monologues, dialogues and letters, whether they are love ballads or address social issues. One cannot speak of Yasmine without evoking England, her second country, where she was lucky enough to work with Herbie Flowers at Dartington International Summer School in 2008, — remember Lou Reed’s riff on “Walk on the Wild Side” ? Well, it was Herbie’s. Yasmine’s path has taken her to Paris jazz clubs, theaters and music stages around France, Belgium, but also to South Korea in 2010, and, of course, to England. 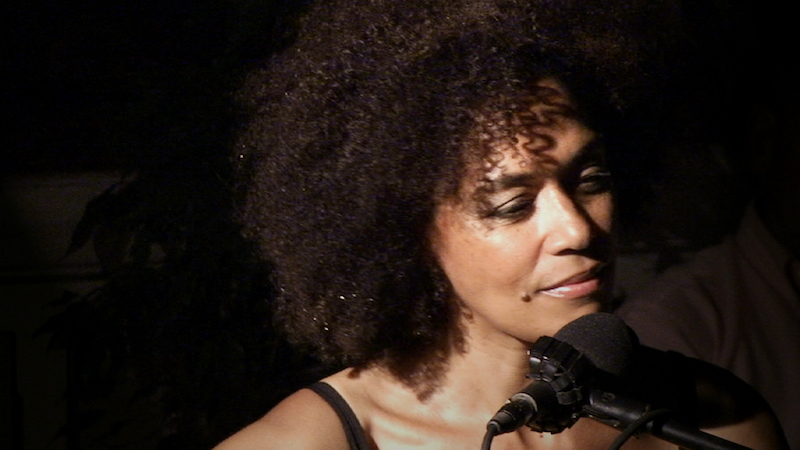 She has recorded two albums so far, “A-Live !” a live album with classical musicians, and “Out of the Blue”, a studio album, arranged by Rémi Toulon, an up-and-coming musician of the jazz scene, and with Emile Biayenda from the renowned band Les Tambours de Brazza. She is currently touring as well as working on new songs.